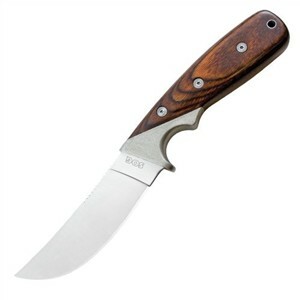 SOG's Woodline knives put the company's tactical quality to work for the hunter and fisherman. Built for practical camp work and survival needs, the Woodline knives skip the military features civilians don't require. There's no tactical black coating, and you won't find a dagger point built for stabbing. The Woodline's blade has the curve of a good hunter/skinner knife, providing enough plain cutting edge for precise work when dressing out game. The Woodline's flat grind also holds up to the harder chores like splitting kindling or taking down saplings. There's plenty of strong blade spine for driving that edge with a wooden club if need be, and you won't risk folding it over. SOG built the Woodline with a distinctive style that's still very practical. The slanted bead-blasted stainless steel bolster is wide enough that the finger choil doesn't even cut into the hardwood handle slabs. The wooden handle completely encloses the tang, but the tang is still wide enough for stout riveted construction and a lanyard fitting at the heel. Jimping on the spine of the 4.8 inch long 8Cr13MoV high carbon stainless steel knife extends nearly half the length of the blade, giving more thumb control and leverage. The 10.4 inch Woodline weighs 8.3 ounces, enough to inspire confidence when you tackle something tough. A folded and stitched leather belt sheath accompanies the knife, with a security strap that snaps into place around the finger choil. As long as that's in position, the Woodline stays put. For a slightly smaller version tailored for small game and fish, see the SOG Woodline Small Fixed Blade.